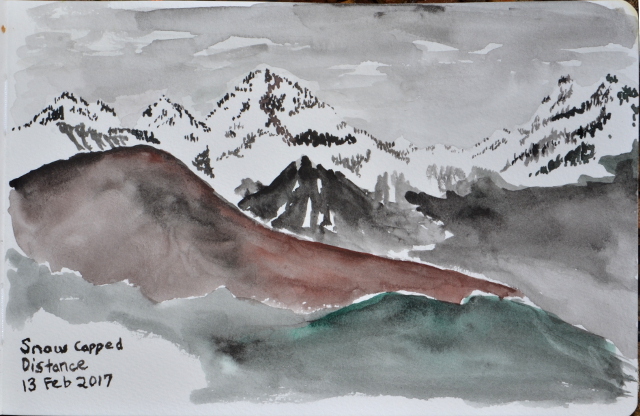 The ink this month even included a little watercolor. It is a little lighter weight for backpacking. 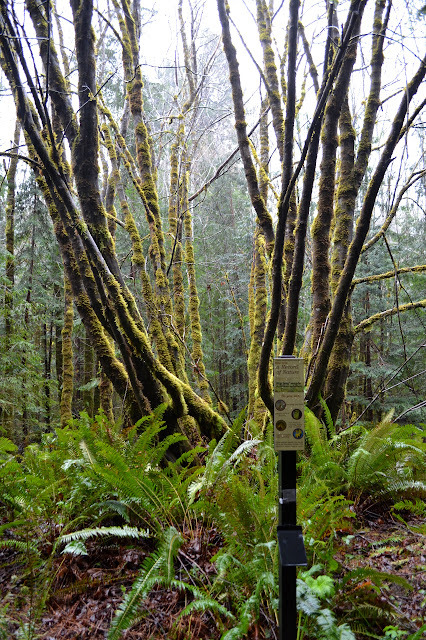 Another while wandering through the Arcata Community Forest. 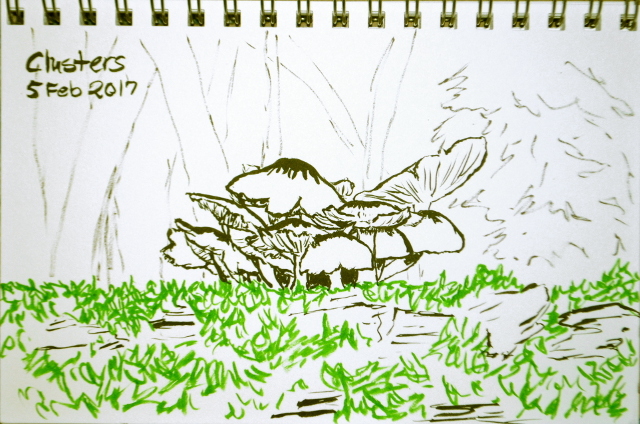 Mushrooms are plentiful in the forest. 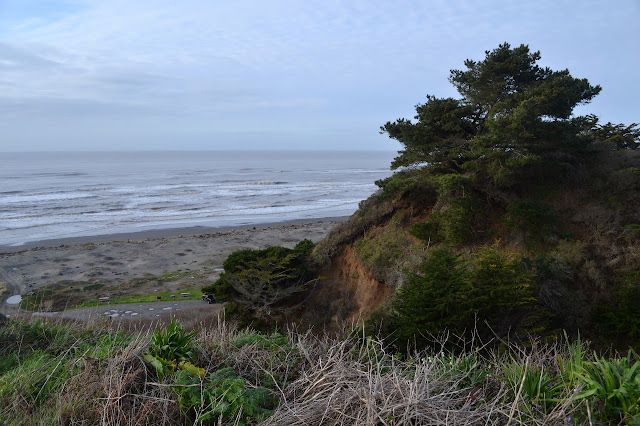 Cut here and there, but I found a nice tree on the sand spit. 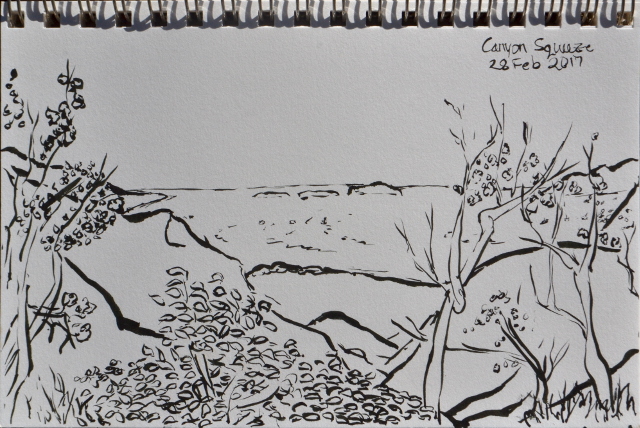 On the third day backpacking, the trees stood out on the distant snowy mountains. 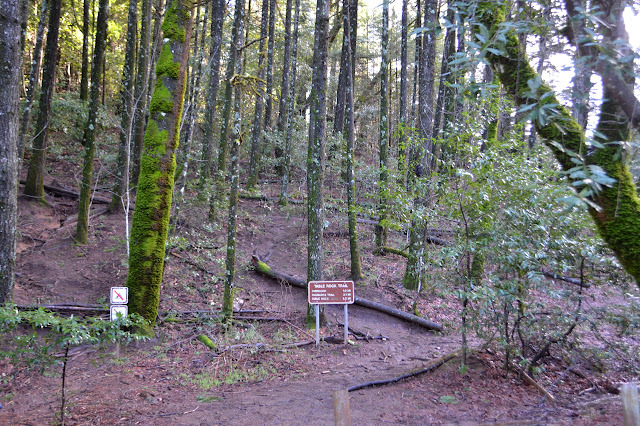 A side trail is needed to find the Boy Scout Tree, which may be the biggest in the forest. 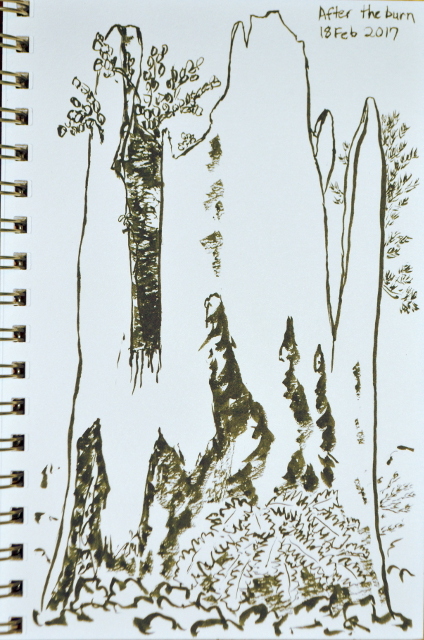 Again in Arcata Community Forest with the brush pens. Wandering up San Ysidro after checking on the well flowing waterfall. Back to my home stomping grounds and between all the rain that has been falling down and the more cascade-like waterfalls I have been visiting, I want to see what some of the local creeks jumping over cliffs are doing. Also, I am a little suspicious we have gotten about all the water we are going to get, so now is the time to see the waterfalls. First up is San Ysidro. This waterfall never quite dried out although at some points you had to walk up and touch it to be sure. A thin film of water kept a vertical garden lush and green, but a cascade of green leaves is not what most people are looking for when heading to a waterfall. I get a late start in order to hit the waterfall around noon when the sun is most likely to be shining on it. It will likely be crowded with a lunch crowd then, but the light is all important. Parking is certainly getting hard to come by as I start. The Montecito Trails Foundation has a few extra signs to help direct travelers where there are no options. One a little further up and pointing left might be useful. The trail changes very little here. Up between a house and a nursery, then left at the private road above. Many walk the pavement, but they are not really supposed to. There are dirt trails beside it for hikers. The road turns to dirt utility access road and this shows some wear and tear from the recent storms. There are small land slides and thin cuts through it by water. It is rockier than usual. Down below, there is the roar of water. The crossing to McMenemy takes a little more skill now, although it does look like there are good hopping stones in place. Long dry tributaries are flowing again, but pose no difficulty in crossing either. 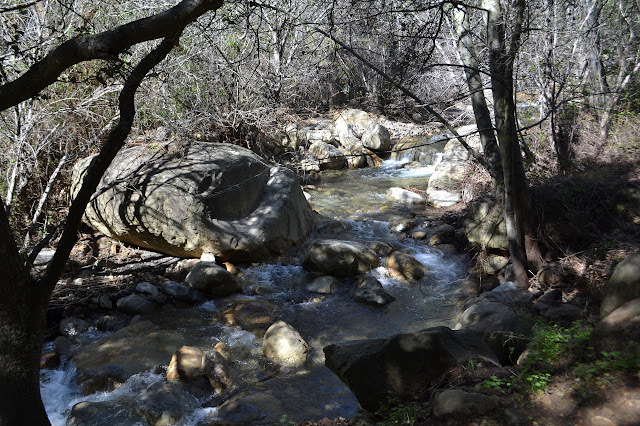 Water, lovely water, coming down San Ysidro Creek. 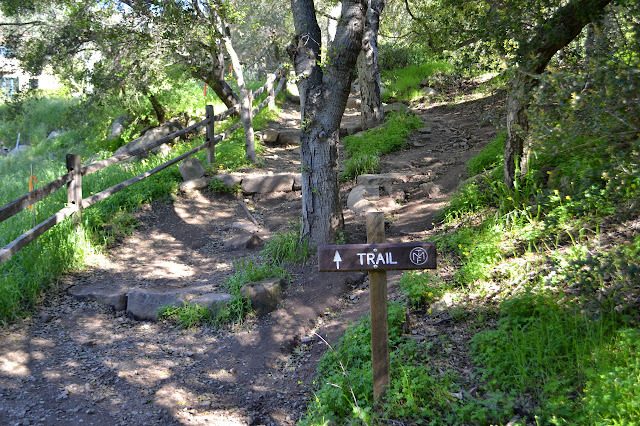 Knowing I would pass through the very general area twice and figuring I should stop and do something along the way, getting to the top of Mount Diablo was at the top of the list of possibilities. I go out of my way to try to find random corner markers, so the initial point for most of the surveys of California is a must visit. There are also all the reasons this was made the initial point, namely that it can be seen from all directions for miles around. This translates into views in all directions on a clear day. Putting it on the southbound leg of my trip means there might be more wildflowers and there are definitely fewer tolls. The mountain can be a drive up. I am sure it is a very pleasant, winding road up, but I want to climb it. As hinted by the myriad of markers on the map above, there are a lot of choices on exactly how to climb this mountain on foot. I decided to build my route on a popular loop visiting area waterfalls. This has the advantage of getting to pass by those waterfalls if there is time and free parking. One probably should not live by the free, but when there are other advantages to avoiding tolls and using the free parking, live it up. On a muddy fire road heading for a mountain. The hills sure are green and the valley oaks are just starting to leaf. Two city streets come steeply down hills to stop just short of the bottom leaving room for creek and trail to pass between, although the creek actually takes a culvert. It is an odd visual. Access trails drop down from both sides. A thin city park follows the creek to the north and the state park starts at a sign to the south. In the time it takes me to pull on my shoes, a pair have gone out to have a look at the trails and decided against a run. I pack in my puffy jacket for greater enjoyment at the top of the mountain, then, on a whim, pull on my rain jacket because something about the morning air just is not warming up. The sign has a map, which is good to review the turns I want to make to get to the top of the mountain. A map in hand is always better, but I have not got one for today. My plan for the route up is Back Creek until it ends at Meridian Ridge, then Bald Ridge and the North Peak Trail to the top. I set off. 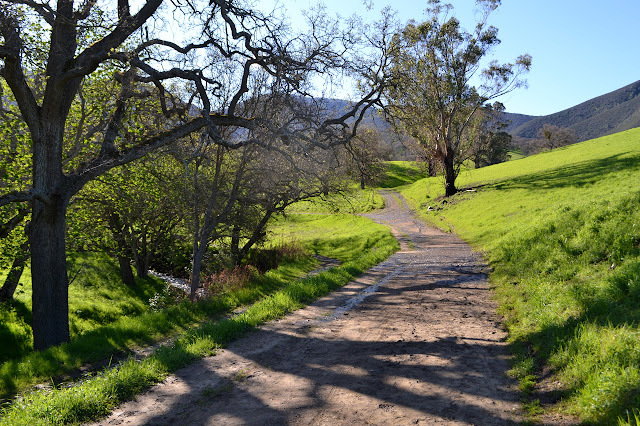 At first, all routes are muddy roads past the lush grass. One peak to the west is cut with the distinctive giant steps of a quarry. Oaks among the grassy hills. Oh, and there are some houses visible. I am expecting it to be dry as I go south, but it has been almost constant rain. There was even rain as I climbed the tight hairpins of SR-29, but as I pull on my shoes the clouds are clearing out as quickly as they can. I seem to have gotten here at just the right time. The air is crisp and my breath comes out in giant puffs. Hail from earlier is gathered in a few spots and pointedly sticking around. 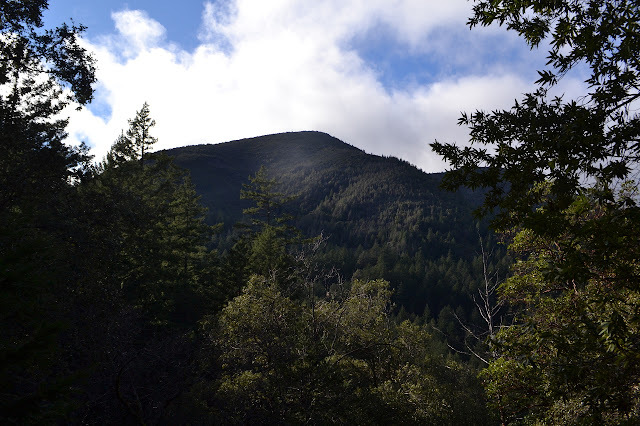 Across the road, the trail starts up to Mount Saint Helena. The peak bagger wants to go up there, but I suspect this other trail is nicer and there are only a few hours until sunset. A couple short switchbacks on the trail bring it up to an old road along the ridge. Trees crowd in tightly around giving very little view. Small break show pieces of what is out there. A sudden break to the left gives a huge viewpoint for the first real look around along the trail. There is a tree down across the trail to it, but I have to go for it. 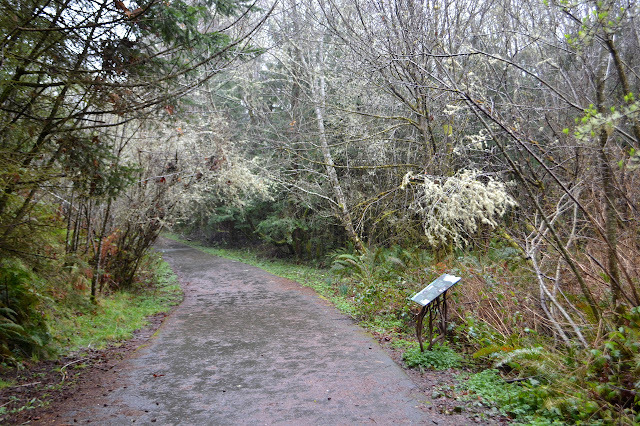 With dense little trees lining the trail, the view can be hard to make out. 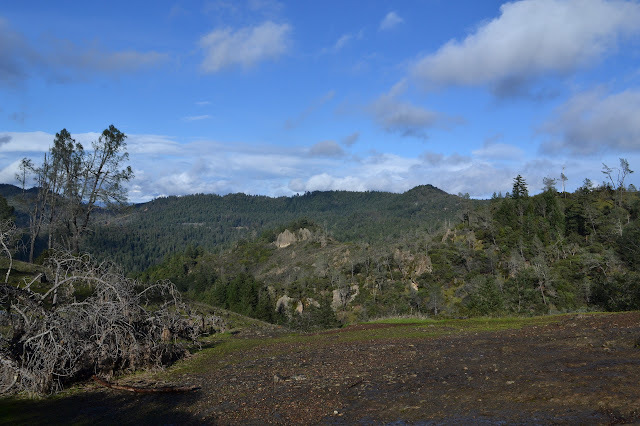 A larger break gives a look back to Mount Saint Helena. An interesting assortment of rock outcrops on display near the large viewpoint. 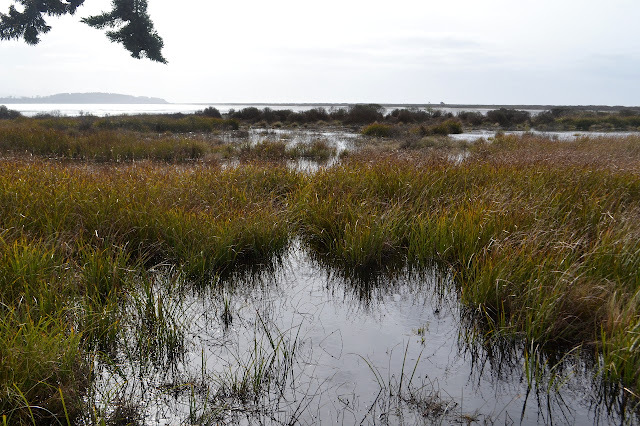 I almost got away with showing the northwest coast of California without rain in winter, but with my days growing short and the weather feeling uncooperative for one last hike, I am out in the rain. The weatherman claims there will not be all that much of it and it should stop pretty soon. Perhaps it will be good to see if my rain jacket is still any good. There is no one in the parking lot as I arrive a bit late in the morning. The rain is coming down harder than I expected and looks settled enough to keep on doing this all week. I just pull on my rain pants and jacket, outfit the pack with its cover, and zip the camera in under the jacket and go. The first mile of this trail is paved anyway. The first mile is a paved trail past detailed interpretive signs and a citizen science project. The climb along the trail beside the river is imperceptible. 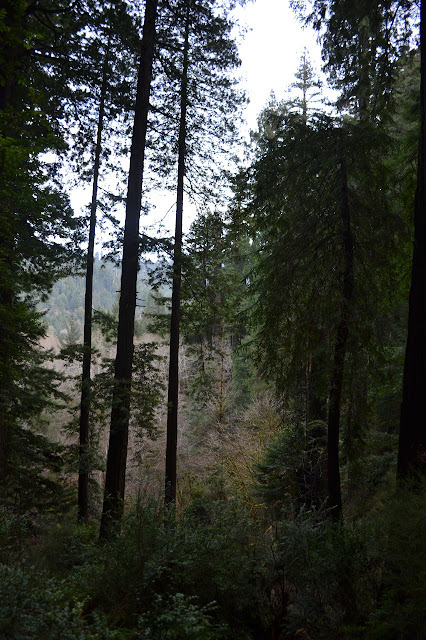 Redwoods are sparse at first, but increase quickly. This is all second growth with a scattering of gargantuan stumps about. Big signs along the way describe the town of Falk that once housed loggers here. 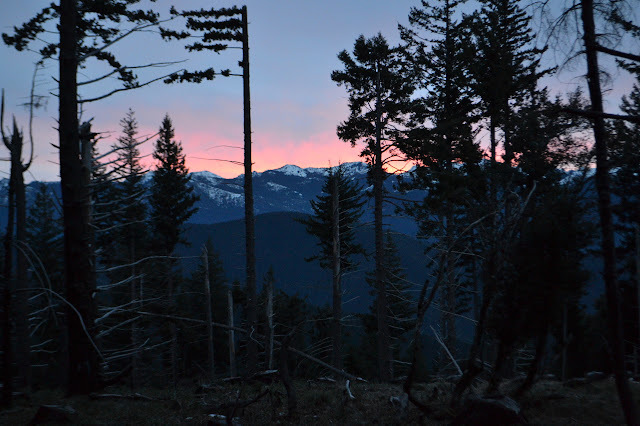 Logging, area plants, and the ultimate effort to conserve the area are all subjects along the way. A second set of tall, thin signs identify a few of the local plants and ask visitors to record the state of it, budding or flowering, in a booklet. Some have soggy protective bags that seem to be meant to hold the booklet, but none actually has a booklet. Most the plants are either leafed out or dormant right now. The weather seems to have won out over this citizen science project for now. Big leaf maple looking pretty dormant behind a sign asking the public to "help keep a record of nature". There was just enough time for a quick trip around the loop to see Trillium Falls and the old growth before sunset as I passed, so I stopped. I had a plan to include climbing the Berry Glen Trail to the Lady Bird Johnson Grove with this for a longer day of trees but suspect I will not actually get to it. And when I finish, it should be prime time for spotting elk in the nearby meadow, which is even an official viewing spot for such wildlife. For now, I head down the paved path. 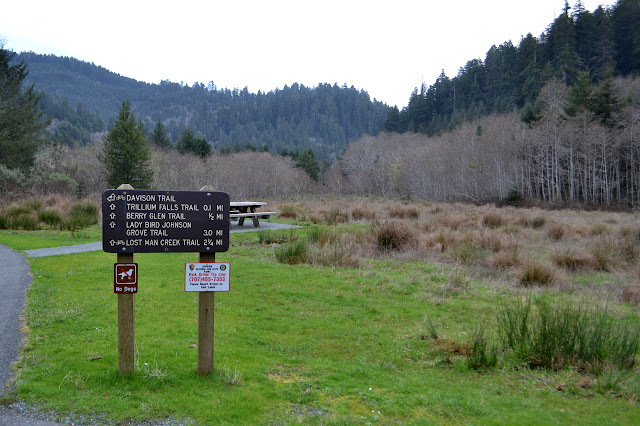 Picnic area at the start of the trail. The parking and picnic area and meadow were once the location of a mill and mill yard harvesting the trees. It was restored to something like its natural state before the trail was opened. 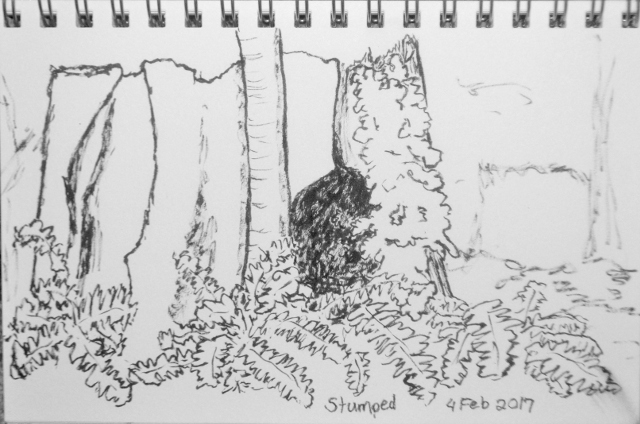 The nearby old growth appears to have been left as a show piece. 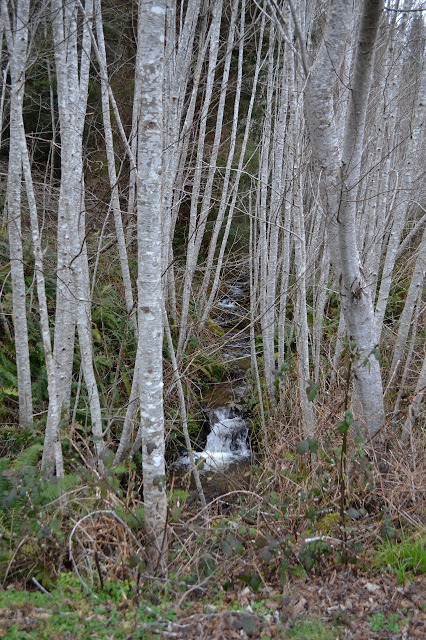 A once buried creek gurgles down between young trees. A dirt trail soon splits off the side of the paved path next to a sign with a detailed map of the trail. The sign shows the waterfall is very early in the 2.2 mile loop. 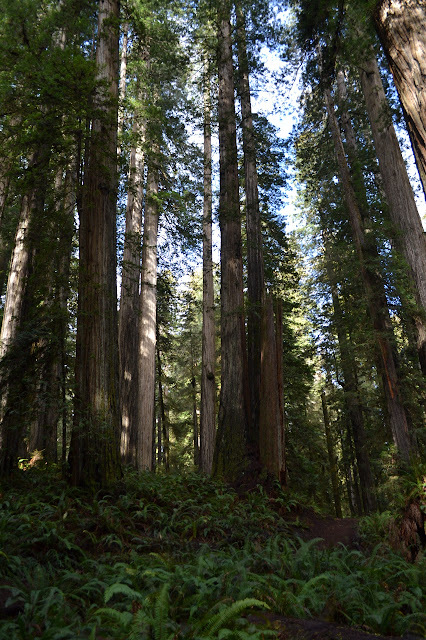 The trail climbs easily upward into the tall trees. A bit of the meadow through past the edge of the trees. Getting out of the car at the trailhead, there is the sound of a fog horn just at the edge of hearing. It is so quiet that maybe I am imagining it. Perhaps I am homesick. This is certainly not a place where the sea comes to mind, but these are coastal redwoods and the coast is not too far away. It is not a day to think of fog either. Bits of blue can be seen above. 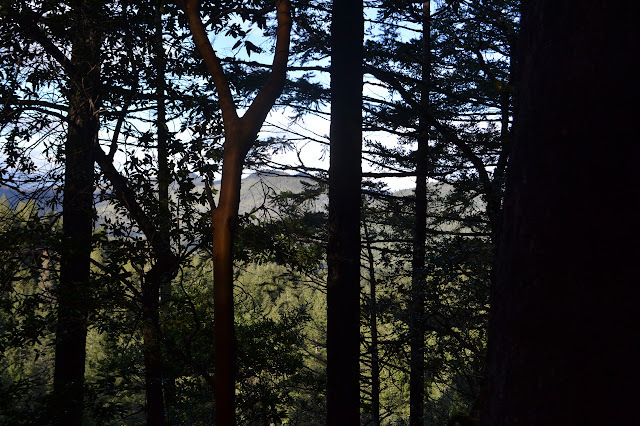 I stand within the old growth and reflect upon the differences between this forest and the second growth of the Arcata Community Forest I have walked through a few times. 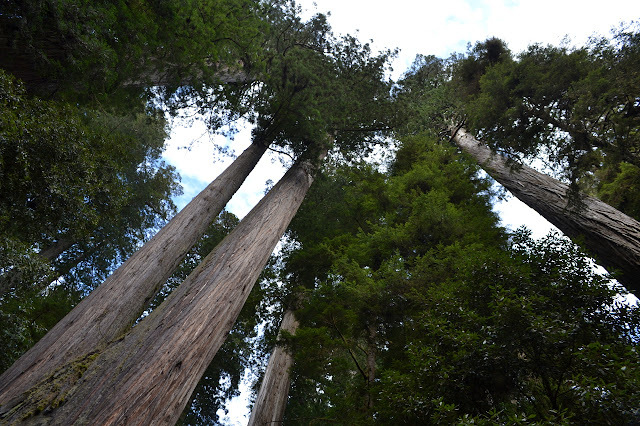 These trees are certainly a lot bigger, but it is more than that. This forest grew up under a previous generation of big trees striving for a bit of sun in that shade. This is a much more open forest. Looking up from beside the road. There is some blue up there. 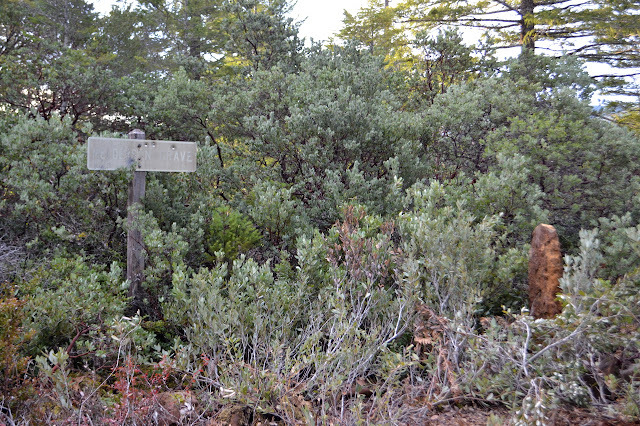 A marked trailhead to start from. In spite of the name of the trail, it does not go to the Boy Scout Tree. It passes near the tree on its way to Fern Falls and there is no sign to point out where exactly. There were no cars as I pulled up, but that changes before I have sorted the things I want to take day hiking from the things in my backpack. This is a popular trail. Winding through tall, well spaced trees. So what did I miss by not crossing the creek and returning along the Old Gasquet Toll Road? Well, besides very wet boots as the sun was dropping into the lower parts of the sky. I drove along the road in the morning. I did have to stop to toss off a few rocks. They were oddly light and one showed some signs that a previous person past should not have rolled over it. And I saw a few of the things I missed. 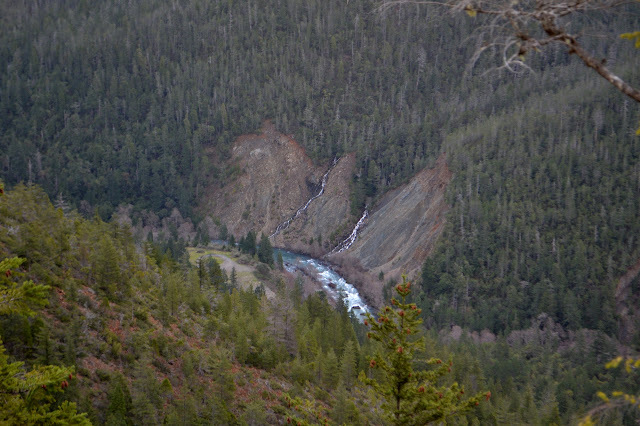 Some better views of the antics the Middle Fork Smith River and tributary creeks get up to. Melderson grave. It could use some brush clearing, but is distinctly marked with headstone and other stones. The only writing on it are scratches. Who puts graffiti on a grave? Better views of the morning clouds haunting the canyons. (Day 3 of 3) There were some hours of clear skies with bright stars and moon in the night, but the cloud cover has returned now. Sunrise is a brief and savage red glow before fading into a general light that could be coming from anywhere. Breakfast on a stump seat is quiet. I did hear birds among the greener lower elevations. Perhaps that is one advantage to having hiked those six miles that got me closer to neither a destination nor my return. Those are were the hardest miles on this whole route. The return from here is a very moderate hike. A brief and fiery glow. The smear in the snow from the motorbike makes me grumble as I return to the trail. Being so close again, I head up to the lookout site again. The bike also went up this spur, right to the top, which does mean a couple small trees have been cleared. The view from the top is still clear. The clouds are all quite high. Avalanche chutes and fog over the river really stand out in this light. The view west from the trail below the peak. The mining is even visible from here. The scar of Holiday Mine is on the bottom left and Toujours Gal Mine where Elk Camp Ridge Trail starts is in the center. (Day 2 of 3) I am sure it was not very cold and it was not very windy, especially for a ridge top, but I slept cold. The bright moon kept the stars from being particularly numerous, but they sure were sharp. 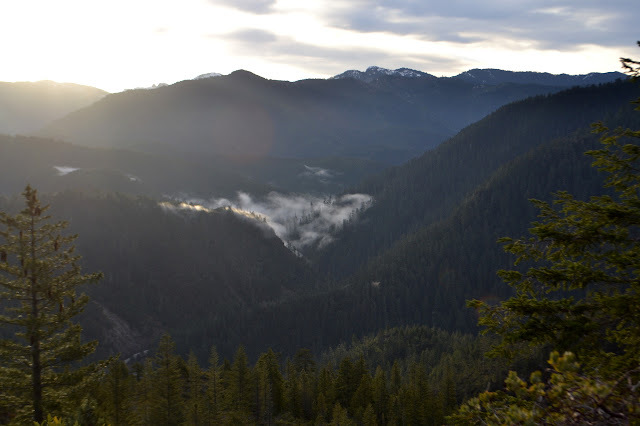 With the morning light, I can see where the river and creeks heaviest by the clouds deep down in the valleys. Wisps of cloud have come in to help decorate the crazy blue skies above. The literature I got from the Visitor Center says it drops 90 inches a year on average around here, so blue from edge to edge during the wet season is quite uncommon. The view from my shelter as the sun comes up. After a little bit of breakfast and packing, I am off along the trail again. It was freezing last night and the trail is full of fun frost decoration. Oh, and my camera lens seems to have recovered. My footsteps along the trail with its top layer lifted by the frost. 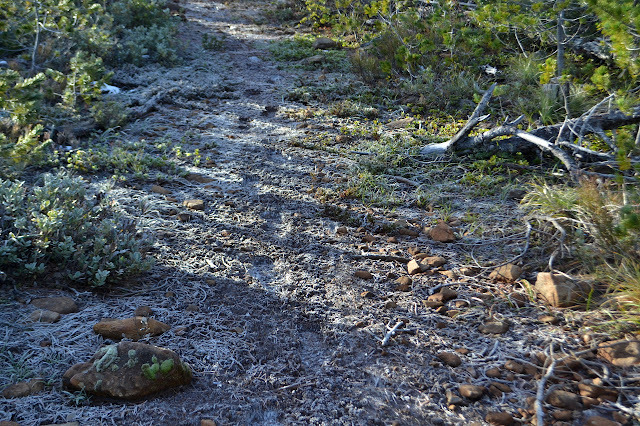 Some remnants of snow remaining on the trail. The snow on the mountains to the north seems to be vanishing quickly as well. (Day 1 of 3) Looking at four days that should be practically dry, I headed out for some backpacking. Just a little jaunt taking up three of the days that should be quite easy except for whatever complications winter has for me. With two spots along the way nearing 4000 feet, there should be at least a little snow. 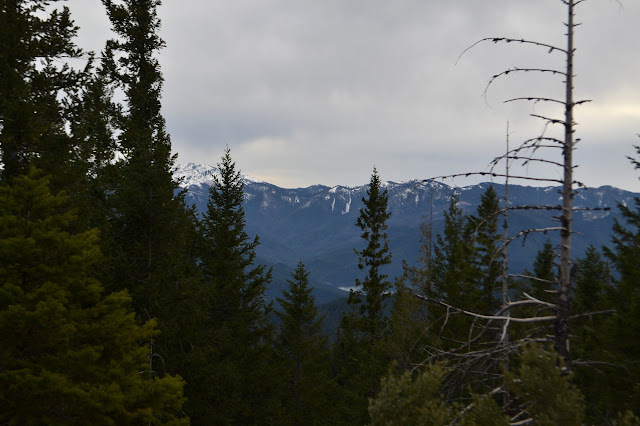 The road from Gasquet Toll Road to the Elk Camp Ridge Trailhead is indicated to be 4WD, but is currently in good repair and suitable for a little car with reasonable clearance. There is no sign to distinguish it from the spurs for power lines along the way. In fact, it is marked as one of these spurs with a temporary sign as two of them lead away from it in a few feet. It does look a little more maintained, so I turned up it and it happened to be correct. Since I wanted to do a loop, I grabbed a turnout halfway up to hike the rest of the way. There are actually some good views even before the trailhead. 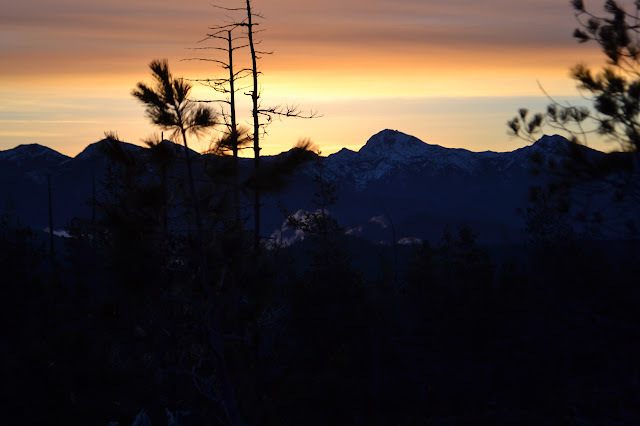 There are some nice spots looking into the valley, but what really catches the eye are the mountains that rise an extra 2000 feet compared to the ones I will visit. 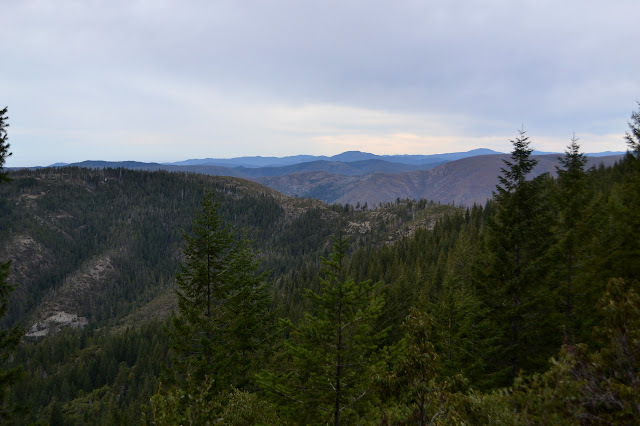 The peaks of the Siskiyou Wilderness rise up sharply to the east seen through the valley of the Middle Fork Smith River. The trailhead itself has a bit parking area, but is also unmarked. A signpost is left from an attempt to mark it, but ceremonial shotgun blasts have obliterated the upper half. A truck drives up as I start up the trail, so I have a fellow and his dog as hiking companions for a bit before they head off for the mountain top. He points out that the time to be up here is May for the rhododendron. 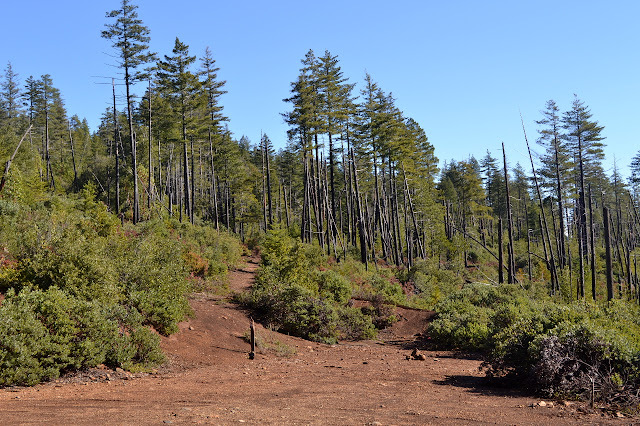 Except for a few short steeper bits, the trail climbs easily upward among trees in a 20 year old burn. 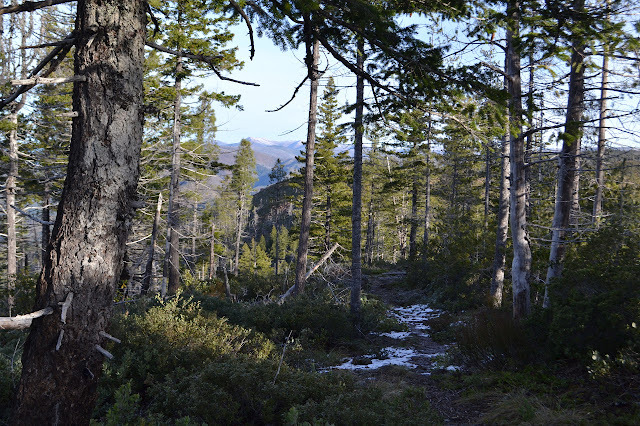 Between the recent storms and the burn, there was some worry about trees across the trail, but there are very few and the trees are generally quite small anyway. Elk Camp Ridge Trail getting started. 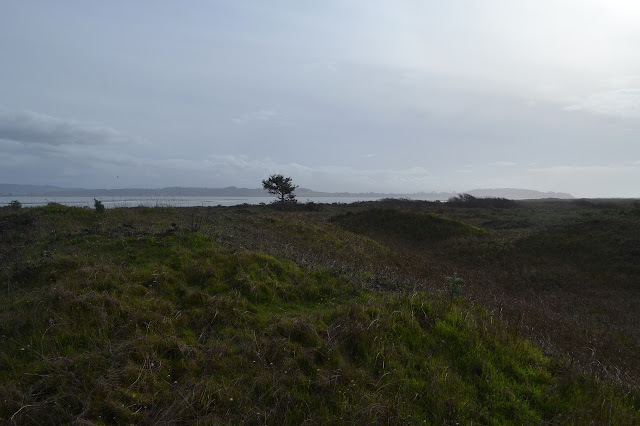 Up at the top of the bluff are a few parks including one where one of the area lighthouses originally stood. Not much of the lighthouse buildings are left now. Signs around the little loop describe what was here and point out what is left. Other signs describe the local wildlife and other details of the area. 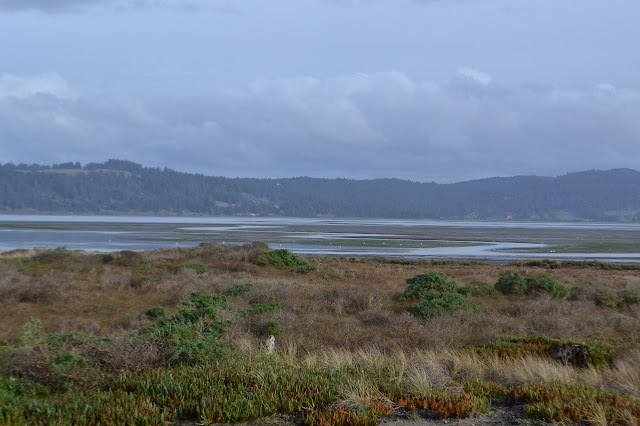 Since the area around includes the bluff top, the Eel River estuary, and the ocean, there is quite a lot of natural things to learn about. 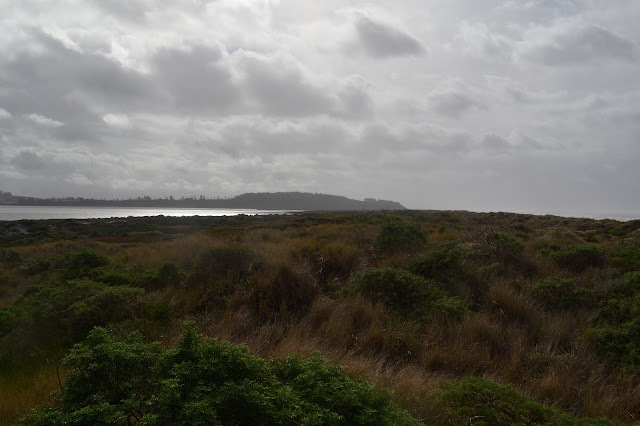 Looking down on the beach and first parking area for the south spit on the way to the jetty. 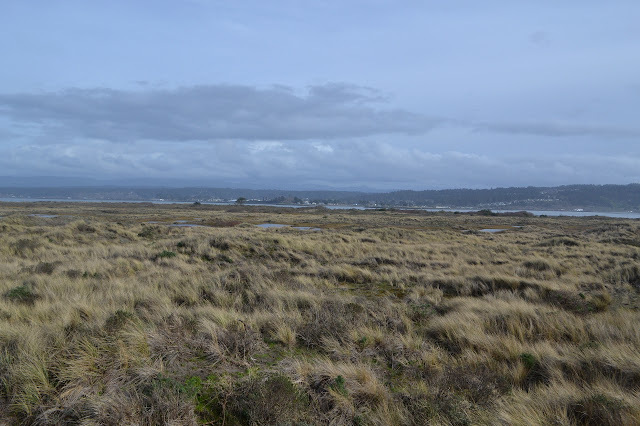 I headed to the south end of Humboldt Bay, stopping briefly at a patch of land at King Salmon on the way. Today should be dry, but the thin drops blown into my face by a swift wind seemed to disagree. 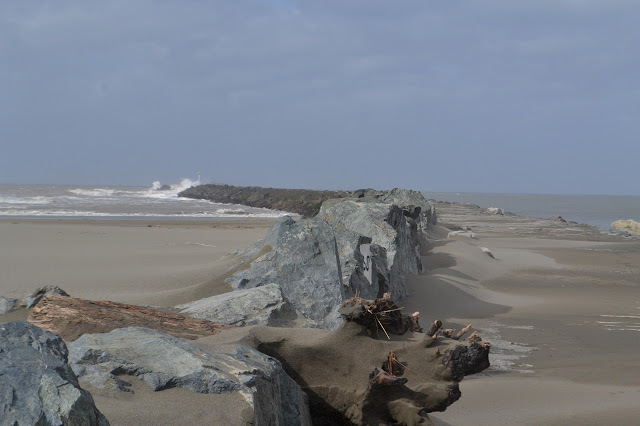 It was drier by the time I found my way over Table Bluff and to the jetty at the north of the spit after one more stop along the way at the middle. Among the grasses and lupines on the sandy dunes. Table Bluff is the central rise of land to the south. 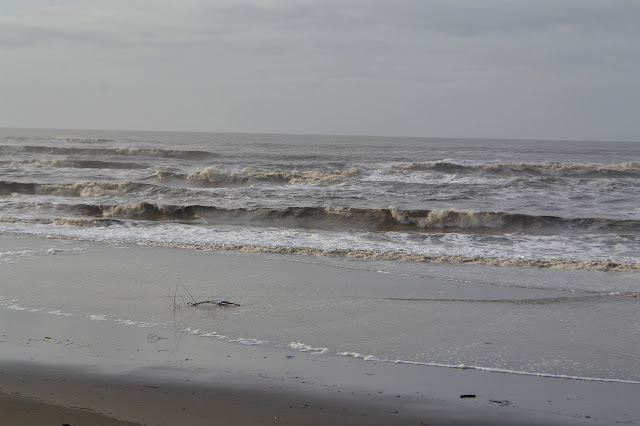 Northerly from the same spot shows the waves that seem to be a little muddy at the moment. The far buildings are on the north spit. 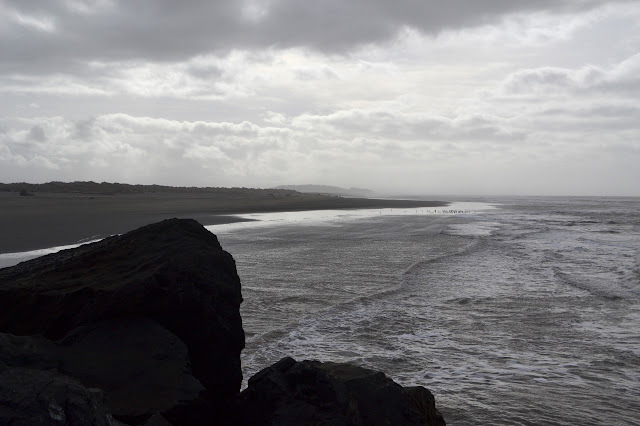 This spit is much narrower than the northern one and the development on it seems to be toilets at either end, the jetty at the north, the road down the middle, and a few navigational beacons. The road becomes more and more of a challenge as I go because it is full of potholes to the point that they are impossible to avoid and today they are filled with water and there is no way to tell how deep they are. 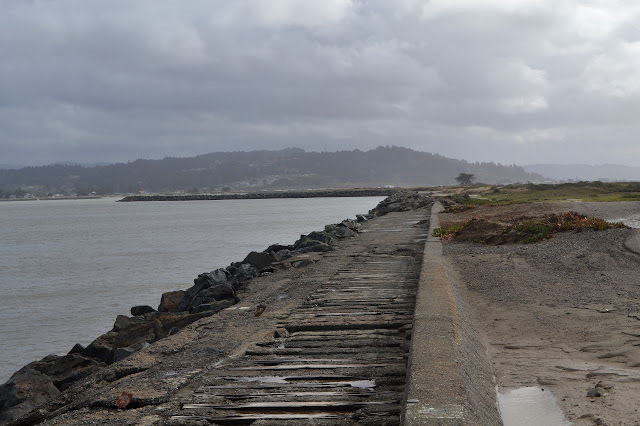 The car made it unharmed and once stopped at the picnic ground at the end, I go for the obvious walk down the jetty. Starting out on the jetty. The surface is quite uneven. Waves splashing over the end of the jetty make it unattractive to continue too far. The missing boards require attention paid for each step, but so do the boards that remain. The moist wood is slick and my feet never quite stay where I place them unless on the cement. 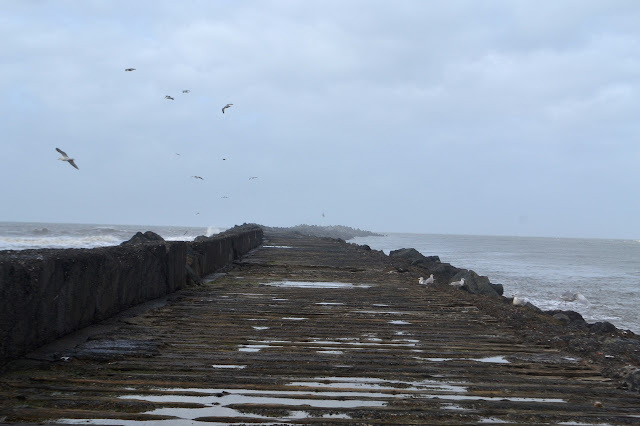 There is a fair bit of jetty. The beach, the spit, and the table at the back. Movement catches my eye on the rocks on the low side of the jetty. Little crabs are scrambling all over them, mostly away from me. 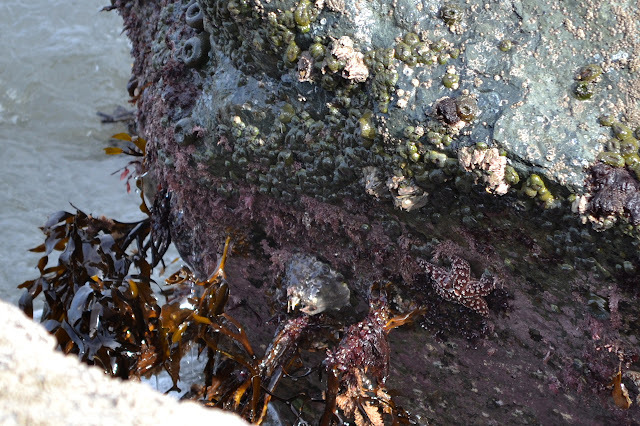 Besides the crabs, they are covered in barnacles, anemones, and starfish. The boulders are also almost as slick as the wood, so climbing down closer to the sea creatures is out of the question. Kelp and barnacles and everything else on the rocks. 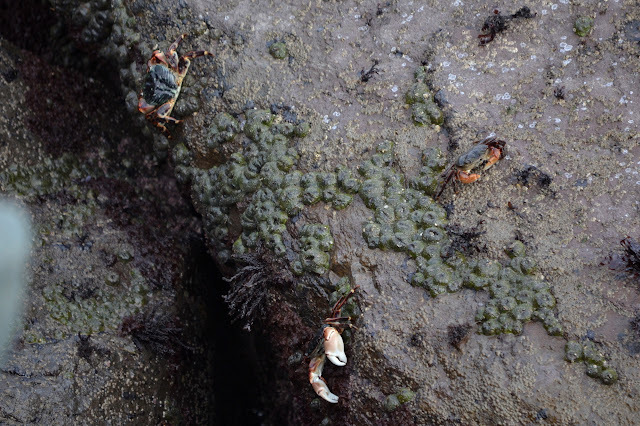 The crabs do not seem to find the rocks particularly slick. 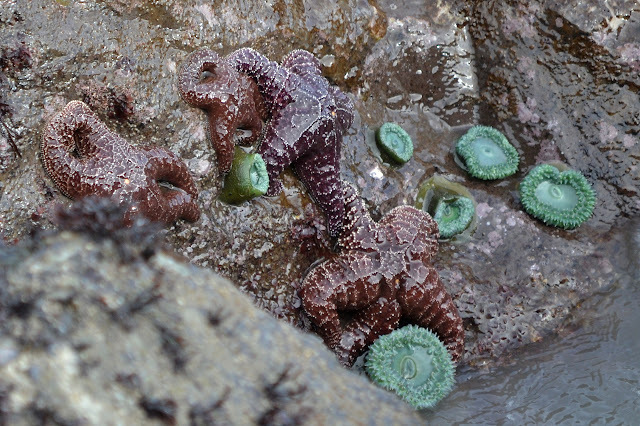 A few of the starfish and anemones. 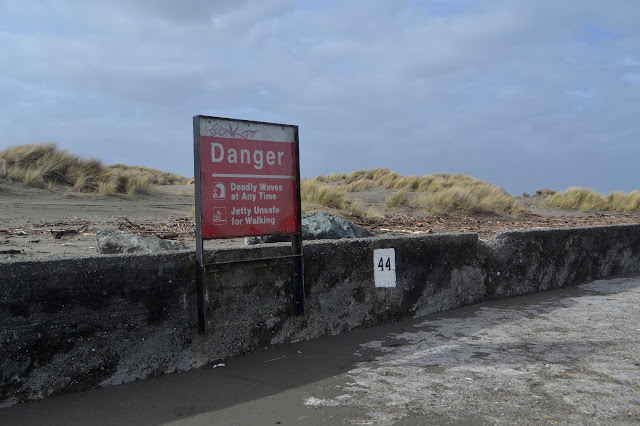 Back at the lot, I am ready to head off again, but a sudden whim hits to continue down along the built wall of the jetty which extends quite a way further along the spit toward the largest of the rare nearby trees. There is a sandy section next to it, so walking is slow work but simple. 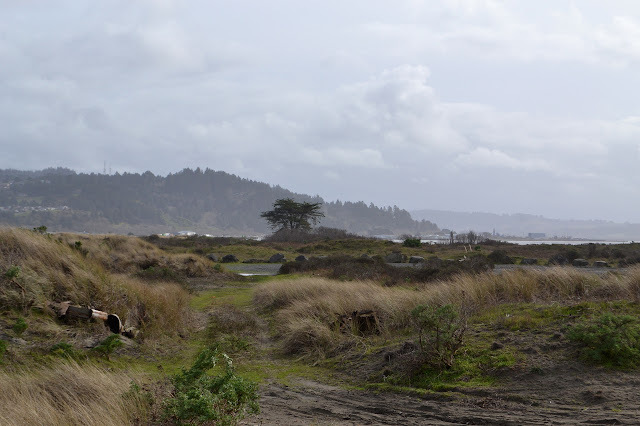 The area is somewhat a mess from off road use even though the only off road use allowed is along the waveslope (that is, the beach) below the most recent high tide line. One such user even passes me by as I go. This improves as I pass the end of a spur road with cables blocking further travel to the southeast. 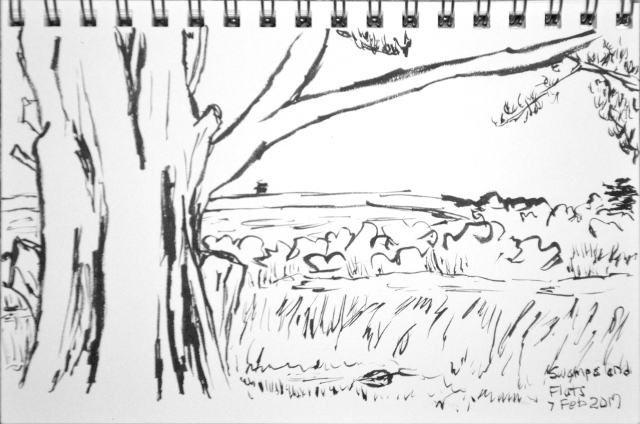 From there, I follow on an old, grassy road toward the point and the tree. 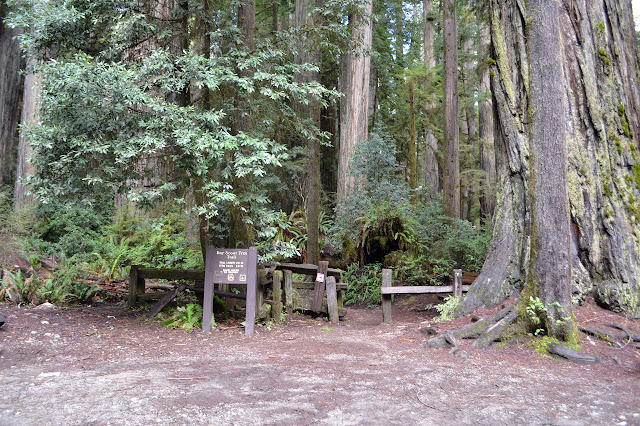 A patch of gravel marks the end of a spur road and across it, the area's largest tree. Beyond that, bay and mainland. 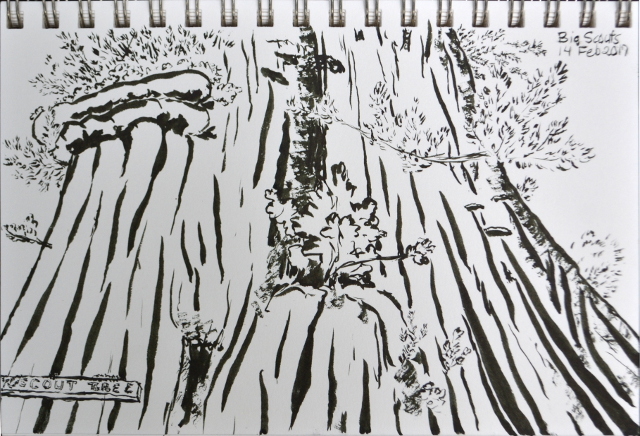 The tree edges on a swampy area, at least in this season. The plants within the lakes suggest these will get around to draining eventually. They are not the sort to live permanently underwater. I head out to a hill near the point too look about. The bay is so narrow at the point that I am closer to my stop at King Salmon on the way here than I am to the road on the spit. 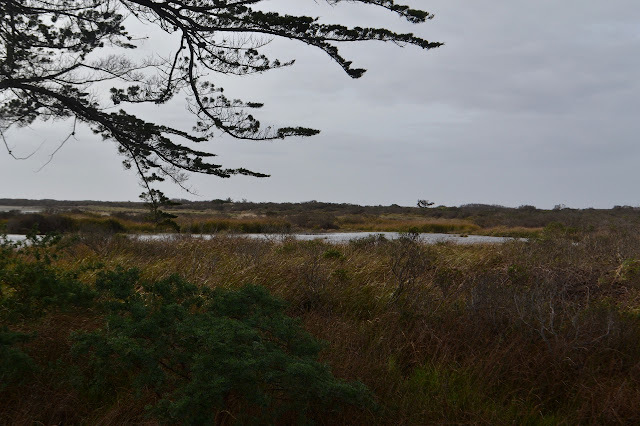 Among the dune grass and lupines and winter pools by the tree. There is another tree far in the distance. The swamp seems a little extensive like it might cause a problem getting back to the road, if I chose to go that way. At the point looking across to King Salmon where a couple more jetties protect the beach. Signs over there explain the erosion project that protects the town. 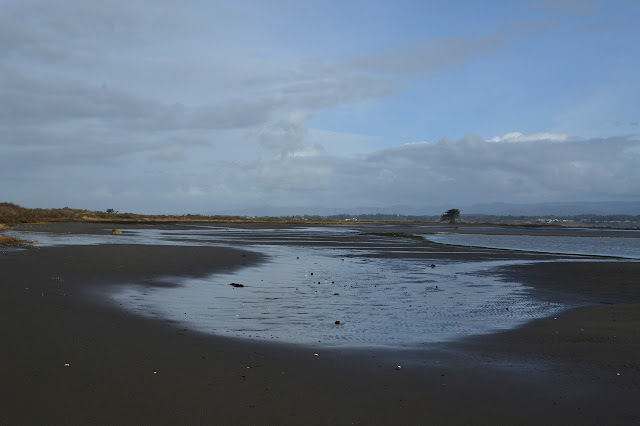 Vast dark sandy flats exposed by low tide extend off to my right from the point. A few ducks and a heron are hanging out on it. This is a prime spot to find duck hunters during the season. Today seems quiet. I head out over the sand for a bit. There are trickles of water draining from the pools in the grass above. The footing is generally quite solid as I cross as long as I do not get too far out into the thin layer of bay water over the sand. 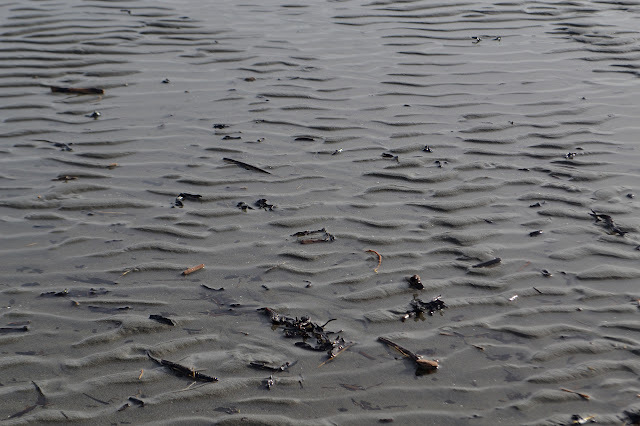 Eel grass and large stretches of sand left by the low tide. Lots of lovely texture out here. 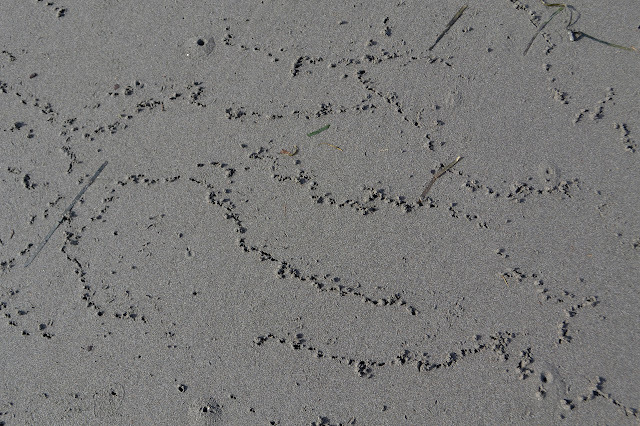 Lines of holes from hunting sandpipers. 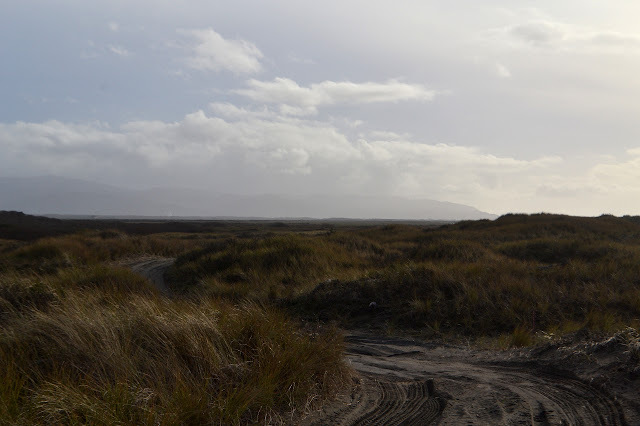 Looking back across the sand flats to the point. Getting impatient for a route out toward the road, I just strike out on my own route. My plan is to cross over to the beach and follow that back, but I am blocked by a series of signs marking an area closed to the public. 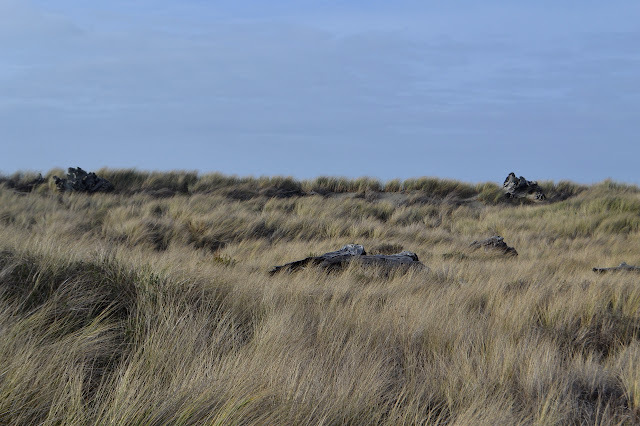 It is an area set aside for snowy plover conservation. There is a faint trail along the outside edge of the area, so I follow that north instead. 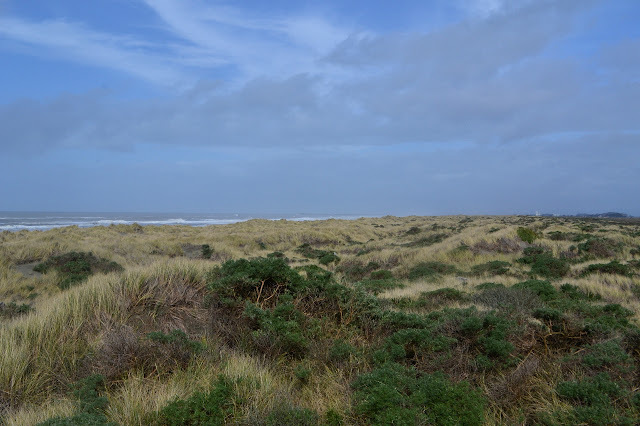 Looking southerly over the grasses holding onto small dunes. There were once a few more trees out here. Or they came in on a big wave. 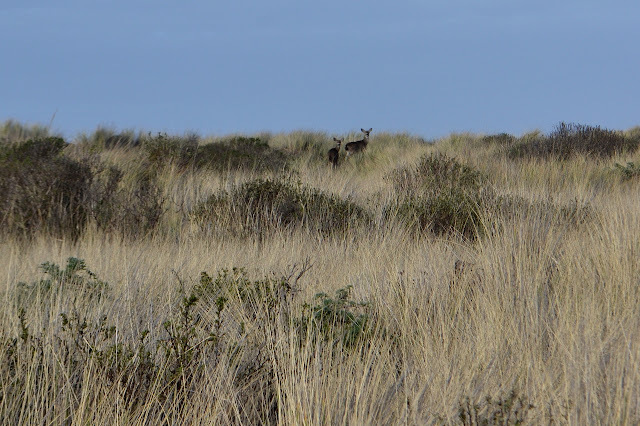 Deer live on the south spit. This is actually my second sighting of the creatures out here. 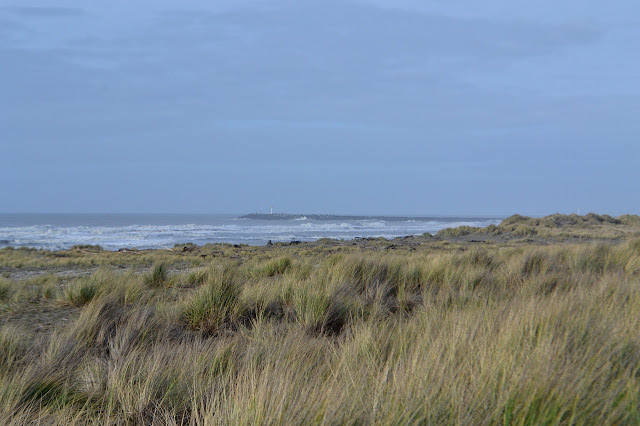 Up on one of the low dunes, I can spot the end of the jetty out in the ocean. 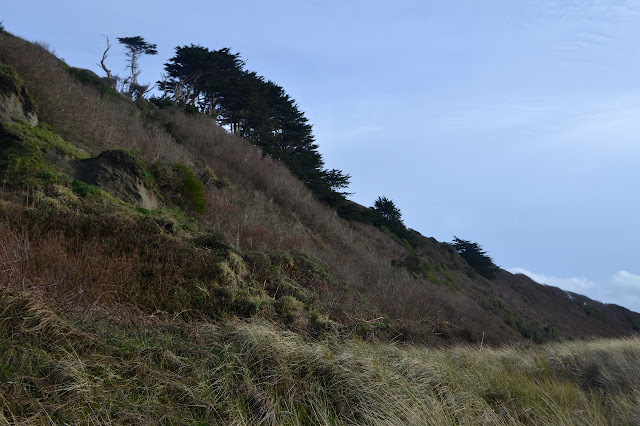 Taking a high point of about 40 feet to look around, across the sand spit. 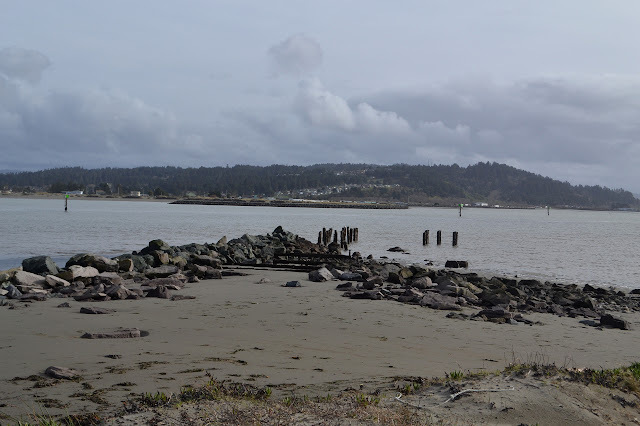 Since I did not get to go all the way to the beach, I stop at one of the parking spots on the way back down the spit for a better look and take yet another stop at the end of the spit. 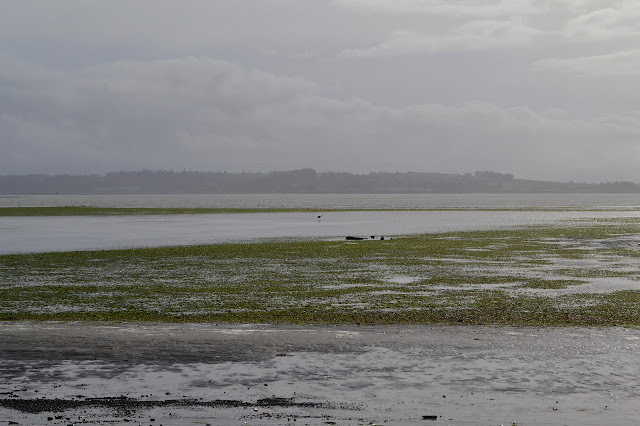 Those flats continue on the bay side of the spit. A few have taken the opportunity to drive on the waveslope today. The waves are dirty from the last storm. Down at the end of the spit and the base of Table Bluff. 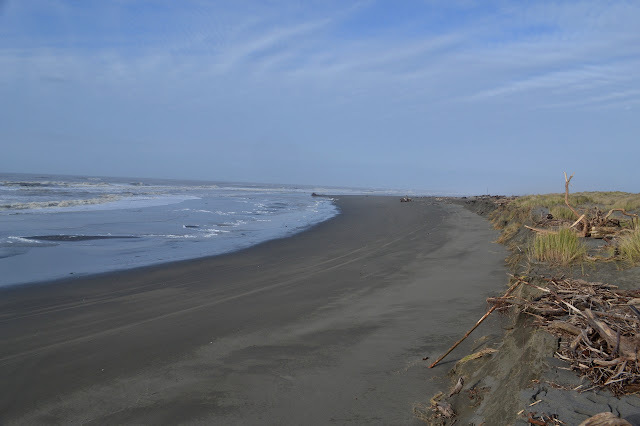 Sandy road continues into Table Bluff County Park toward the Eel River estuary.